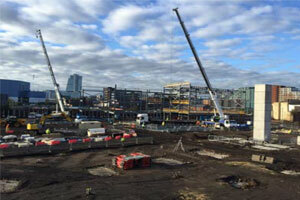 The building work on the site of our new school is really starting to take effect. The steel and the precast floors are complete to the first section of the sports hall and work has commenced the STEM block. The £21 million build of our brand new school building will be located on Black Bull Street, Hunslet opening in September 2016. We are really excited to see these developments and we will of course continue to update you on progress through our newsletter. You can view our latest episode and download a copy below. BAM have been appointed to undertake the design and construction of the new building. They have provided information in the form of a 2 page PDF which is available to view and download at the bottom of this page, underneath the newsletter.